Hands up if you like popcorn! It’s been popcorn galore on the blog recently and seems to be very much the in thing at the moment, which I really don’t mind. Today’s review isn’t just your average popcorn, oh no, today is the turn of the Ninas Super Fit Popcorn. A little while back I was asked by the lovely Rhiana if I wanted to give a brand new brand of popcorn a whirl, and what made this different to all the rest is these are a range of naturally nutritious superfood popcorn. I am indeed a curious bean as to how popcorn can be superfied and whether all those antioxidants and nutrient rich ingredients can actually taste good. What I am sure of is how delightfully tropically exciting the packaging is! Based in London, they hand-pop wholegrain corn in coconut oil using artisan kettles, and season using nutrient rich super foods and 100% plant based ingredients. Rejoice because these are dairy, gluten, wheat and refined sugar free! So far Ninas has four flavours which some are pretty hard to even pronounce – Sriracha & Spirulina, Cacao, Goji Berries & Pistachios, Lemony Kale & Black Pepper and Sweet Coconut, Himalaya Pink Salt& Maca. So let’s get tasting. With a dusting of neon green over popped kernels it did look a little toxic and strange. With zesty lemon it smelt far more inviting than it looked. Initial taste was certainly of greens which reminded me of my roast dinners, this thankfully quickly developed into a hot peppery taste a bit like when you bite into a peppercorn that hasn’t quite been crushed. The lemon comes in very much at the end to give a bit of relief from the fiery peppercorn and provides a lightness to the popcorn. This was another green number but darker. Not knowing what either of these ingredients tastes like on their own I really cannot describe how this popcorn tastes other than it’s just odd. 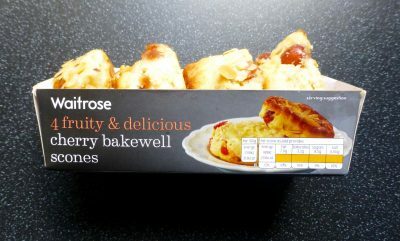 It is spicy as it suggests but aside from that I really do not like it one bit. Spotty and eye-catching these smelt nice and chocolatey. The rich yet slightly sweet cacao was absolutely delightful and the darker the popped kernel the more chocolatey it was, making this the ultimate guilt free treat. Those kernels with more coating did change the texture of the popcorn and made it a little powdery but did not take away from its deliciousness. The crunchy pistachios although not specifically identifiable in taste it does give a nice nuttiness to it. In the background a slight coconut taste lingered which I assume is from the coconut oil used and rounded this popcorn off nicely. Love Love Love! These had far more of a glazed coating than the other three flavours and the smell alone of fresh coconut was enough to make me want to dive right in. The rich golden colour from the kernels made way for a crunchy popped kernel and gave the base needed for the coconut flakes to stick to. The sweetness from the glaze and coconut it slightly offset by the himalaya salt creating the perfect balance. Yum! 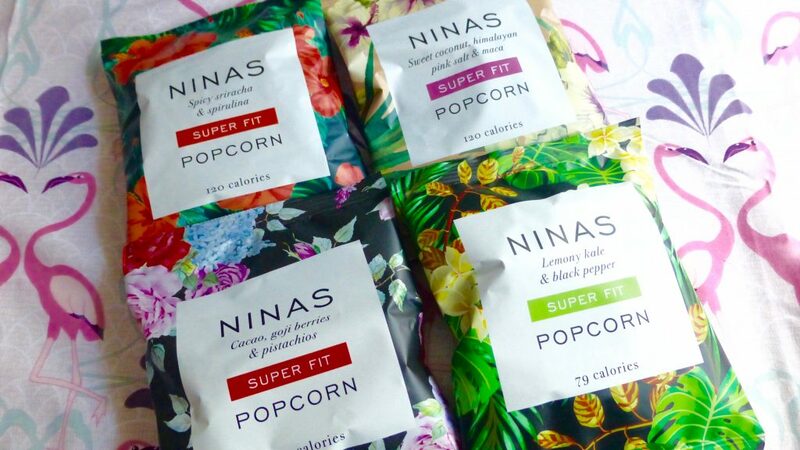 Ninas Super Fit Popcorn is a mixed bag of odd and blooming delicious. 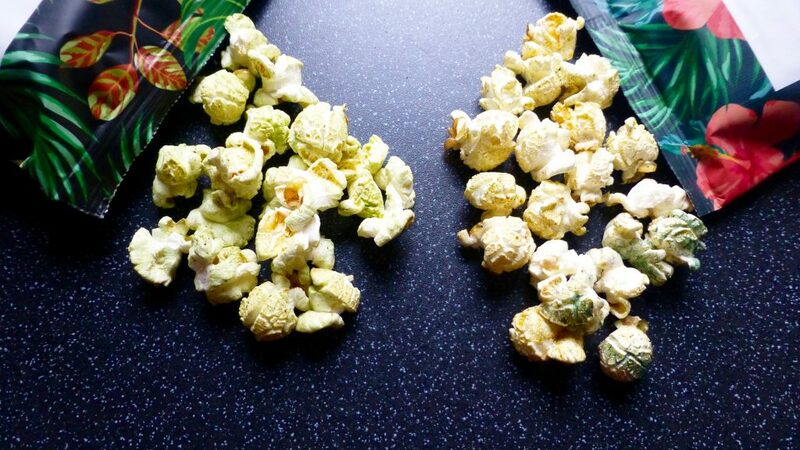 I really cannot get my head around the green tinged popcorn and are only going to entice a select audience. As for the Sriracha & Spirulina to me it is the worst and if going to be used should not be a stand-alone flavour. On the flip side I am loving the Coconut and Cacoa flavours and am most surprised that for someone who really doesn’t like coconut on things, how much I loved this popcorn. If you’re interested in trying these head over to Ninas shop here. There are Taster Packs available of all flavours for £8.00 or 12 packs of one flavour for £19.99. I would like to have seen a pick and mix option so hopefully Ninas Popcorn will creep into shops soon because I want those Cacoa and Coconut ones readily available to me at all times!